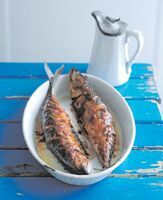 This mackerel recipes collection has been kindly provided by leading chefs and cookery writers to share at Scottish Recipes. It is a delicious oily fish and is healthy to eat, making this an ideal dish for those with health problems like those suffering from high cholesterol or arthritis. These natural oils have been clinically proven to help improve health and well-being, are good for the joints and help to lower cholesterol as part of a healthy balanced diet. This marinated mackerel recipe comes from The Fishy Fishy Cookbook by chefs and food writers James Ginzler, Loz Talent and Paul Shovlin who together with television personality and presenter Dermot O'Leary run the Fishy Fishy seafood brasserie in Brighton, England. Their ethos is to only serve fresh and local caught fish accompanied by in season ingredients to serve customers a wide range of delicious meals. It will serves four; try it with the sticky sauce below for a burst of flavour. 1. First make the marinade sauce. Place all ingredients in a non-reactive saucepan and bring slowly to the boil. Simmer for 5 minutes then allow to cool. Set aside until needed. 2. Preheat the oven to 180C/350F/gas 4. Make small cuts along both sides of the mackerel and season inside and outside. Heat some olive oil in a frying pan until smoking then char each side for a few minutes. Transfer to a roasting dish and put in the preheated oven. 3. After about 10 minutes take out the fish and paint the sticky sauce across the top. Return to the oven for a further 5 minutes until the sauce looks thick and sticky. Serve immediately.